New Funko pops coming soon as Zenyatta, Roadhog, Zarya, Mercy, Sombra, and Junkart! A whole new wave of Funko Pop vinyl toys are being added to the Overwatch lineup and they are truly awesome. 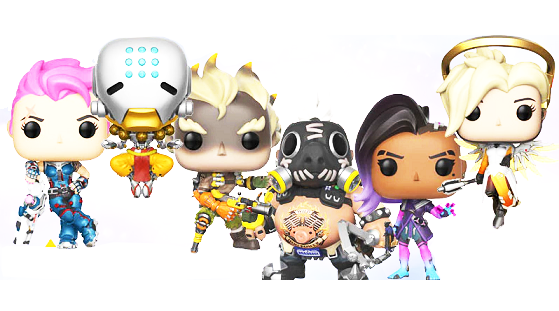 According to Blizzard - Zenyatta, Sombra, Junkart, roadhog, Mercy, and Zarya will be soon added to the Funko Pop toys. They will usually go on sale around $10 to $15. Bigger Pop! toys generally cost more a bit than the standard line, like Overwatch's Reinhardt and DVa toys, but new toys will be of regular sized around 3 3/4 inches tall and will be costlier than traditional Pop! toys. Although there is no official release date made available for Overwatch figures, and their current line up of toys which includes Pharah, D.Va, Mei, McCree, Symmetra, Lucio, Winston, Reaper, and Widowmaker are seriously cool. Blizzard also offers toys from Figma and Nendoroid lines which are bit costlier than Pop vinyl. Via the official Funko blog, the next Overwatch pop figures will consist of top of line six new figures which will also include bigger 6-inch Roadhog with a bit more price tag.